Staying binge free through the holidays. Well, I don’t fully agree. With some consciousness and attention, you can care for yourself and have your needs met when you go home for the holidays. First off, have an action plan. Do you tend to binge when you are back home? If so, when? Is it at night when your family is asleep? Here are some ways to keep yourself occupied at night. First off, when you feel a binge coming on, if you can and it’s safe to do so, maybe you can get out of your house and take a walk around the block, or sit outside and look at the stars for a while. Allow yourself to wish on a star and gather some strength for going back inside. Do you have fun books or magazines to read while you’re there? Something to occupy your mind? Something to help you shut down? DVDs that you enjoy? What about your laptop? You can get onto your computer and send out an email to a discussion board for example go onto an OA board and post there. You will get support immediately, and even looking through others’ posts about how they are surviving the holidays will help. Too late? You’ve already started? It’s not too late. YOU. CAN. STOP. NOW. I know that it feels like one you’ve started a binge that it’s all over, but it’s not true. 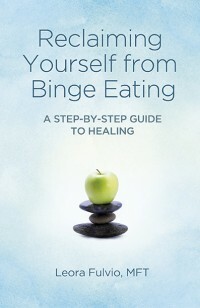 You can choose to stop a binge. You can interrupt the binge and sit with your discomfort around it. The more you exercise that muscle, the stronger it will become and you will find yourself becoming stronger than the binge. Your ability to sit with your feelings, and increase your capacity to sit with uncomfortable feelings will enable you to become stronger and stronger and thus rely on yourself to care for yourself in tough times rather than food. What about chocolate and cakes and cookies all sorts of things at the office? Now this is a hard one. Of course it’s okay to have one or two treats that people bring in or clients send, but if it’s going to trigger a binge, it might be best to stay away from these treats for the time being. If you chose to have something, give yourself a limit. Just one or two pieces. Then, sit with what you’re feeling. Set an intention for yourself that you can have a taste or a snack, but this is not going to lead to a binge. Just because you’ve had something “unhealthy” doesn’t mean that your day is ruined and you have to go home and binge. You can stop at just a few pieces of cookies, cake, candy, etc. There is a common feeling amongst all binge eaters that if they “eat off” their day is ruined and they might as well have a free-for-all. This is flawed logic. How does eating a one piece of chocolate or a slice of cake equate to having to go home and eat a whole box of cookies? It doesn’t. Just think of what it would be like to be a normal eater, to be able to have a slice or a piece and then continue your healthy eating regimen for the rest of the day. You can’t let yourself start? Then don’t. Again, it’s about getting support, calling a friend, getting some fresh air, sipping some tea, treating yourself to a manicure, pedicure, massage, new book, call to an old friend… whatever it is that nurtures you. Okay, now what about holiday parties? Again, you need an action plan. The first thing you must remember to do is EAT before you go. You don’t want to show up to a holiday party hungry. It can cause too much time at the buffet table. Allow yourself to arrive at the party feeling satisfied. Check out the buffet table, figure out which are “safe foods” (non-binge triggers) that you can let yourself enjoy that night. Allow yourself to take some time to mingle, talk to people, enjoy the party, and then, when you are ready, make yourself a plate of the foods that you will enjoy that evening. If this seems like an impossible feat, have some resources available. First, make sure to eat dinner before you show up. Then, once you get there, position yourself away from the food and focus on the company. If there are kids there, play with children too, great fun to occupy your mind. Stay away from alcohol as well. Make sure that you have your cell phone with you so that you can call a supportive person if you become overwhelmed at the party or bring a safe person with you to the party and explain to him or her what your goals are and what your needs are. If you find yourself not able to make it through, give yourself a break and leave early. You don’t have to stay late, you are allowed to make an appearance and take care of yourself and your recovery. The best holiday gift that you can give yourself is to stay healthy and true to yourself. If you are able to make it through the holidays, or at least a few days of the holidays without binging, you don’t have to worry about making those all or nothing new year’s resolutions (I WILL NEVER EAT A CARB AGAIN!) and then wind up binging on January 4th. Stay conscious. Stay focused. Recognize yourself. Have an observing ego around your binging and have fun with it. Notice where you are, what you’re doing, what you’re feeling and what happens to you as you fall into bingey, snacky, eatty moods. This holiday season, you can really get to learn and know yourself.